Touch has some nice CSS3 animations like slide, flip, fade, pop and cube…but what if you need something different, like a custom slide-fade animation? I’ve covered how to use animations in Using CSS3 animations on Sencha Touch and Animate components in a view, but I didn’t cover the internals of the framework, nor how can you create a custom animation. So let’s take a look at it, step by step. Let’s first clarify some of the concepts. Ext.Animator and Ext.Anim classes are different. While Ext.Animator provides full animations for components, Ext.Anim provides a much simpler approach for DOM elements. So don’t expect to slide a container out of the screen with Ext.Anim and have the hide event fire only when the animation is over. This is responsability of Ext.Animator. Animator for components, Anim for simple DOM animations. As I said, Ext.Animator is responsible for components animations. It will pause events like hide, and resume when the components is totally hidden, and so on. It has 3 key packages: Runner, Animations and Layout. You can see that Ext.fx.Runner is pretty simple, and currently only returns an instance of Ext.fx.Runner.CssAnimation. It means that when the framework starts, it will create an instance of Ext.fx.Runner and hold it with the reference Ext.Animator. 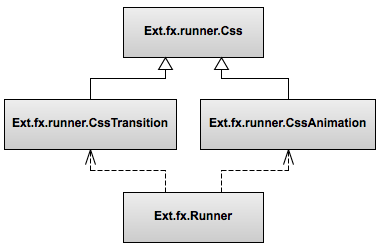 This is what the frameworks uses for running its animations, Ext.Animator.run(). This is the first piece of Touch Fx package, the runner. Let’s move to Animation classes. Ok, we have a class that runs animations, now we need classes that define those animations. It all starts with the abstract class Ext.fx.animation.Abstract, and its extensions Ext.fx.animation. * : Cube, Fade, Flip, Pop, Slide, Wipe. If the animation is “out”, which means the popOut animation, the opacity and scale will go from 1 to 0, and the inverse if the animation is a popIn, going visible on the screen. You can look other classes like Fade, Scale and so on, and verify that they are pretty simple. This is the key for creating our custom “Slide-Fade” animation. Let’s go even further with the next step, animated layouts. What if we need our custom animation embedded in a card layout, so cards go out with scaleFadeOut and in with scaleFadeIn? We need to create a layout animation class. Currently the card layout is the only who actually makes use of animations. The basic idea is to have a class Ext.fx.layout.card.Abstract that listens for the activeitemchange listeners, and once a card changes, the old card is hidden with an out-animation and the new card is shown with an in-animation. Pretty simple isn’t it? With that we cover the last piece, and we are able to create something like the code below. A container with a card layout using our custom animation for transitions. This wraps up everything about how CSS3 animations works in Sencha Touch. You’re now able to create the coolest animations and tie everything up with Touch components, taking full advantage of the framework. The topic is a little bit complex, so let me know if you have comments and doubts about it! Hey buddy great tutorial i was looking for something like that which allows me to customize the animations.I am facing problem to integrate your code with my project.I am working on a project with MVC architecture.I tried to integrate the code in my app but failed to do so.Can you pls share with us how we can integrate your code with MVC apps. Thanx in advance. I also used ‘animation’ instead of ‘type’ but nothing happened.Can you pls explain this and suggest me to solve this. hey man can you post a working example of this one as you can see I am a total newbie in sencha I need it as reference because currently I am working with something which will be passed on my subject Independent Study. You are covering some great stuff here… thanks a lot! is everything still relevant according to your knowledge?